Also, I’ve found that political issues have a way of bringing out the ire in otherwise kind and generous people. And I’m not eager to have that heaped upon me. Now, futile or not, ire or not, I can stand quietly by no longer. My hope is that what I write brings about understanding and connection that ultimately makes a difference. 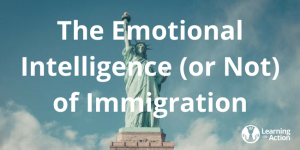 So, with great trepidation, I wade into the timely and highly political topic of immigration with a blog post (guaranteed to be at least partly futile and somewhat ire-inducing) that hopefully sheds some light on the Emotional Intelligence (EQ) aspects of this issue. Note: While I’ve been accessing anger and experiencing at least a couple of its gifts (in particular, direction setting and motivation), my intention is to keep that anger out of these posts (as anger rarely connects us all). I’m no expert on immigration. And I don’t have a solution to the challenges that illegal immigration presents to our country. I do know a bit about Emotional Intelligence as we define it at Learning in Action. And the EQ essence of the immigration debate is boundary setting and compassion. And if we tend toward thicker boundaries, compassion can keep us connected while we work out our differences. Compassion is the glue that can help us stay in relationship in tough times. Compassion connects us with others through shared thinking, feeling and wanting, and honors the inner experience of others. Staying separate and connected (with healthy boundaries) and compassionate can be extraordinarily complex, energetically challenging and incredibly uncomfortable, particularly when we are in conflict. I call it “withstanding the thousand tiny paper cuts of being in relationship.” And it’s tough to get it just right and most of us don’t. And we can try. Because the ideal EQ of both separate and connected is so challenging, most of us tend to lean one way or the other – toward either being unseparate or unconnected – when we are under stress. When we lose our separateness, our boundaries can tend to blur, making it difficult to separate what’s me or mine from what’s you or yours. Do you identify with any of the above statements? When our boundaries are so blurred, we can literally lose ourselves. And as a nation, if we applied our blurred boundaries to our immigration policy, it would pose an incredible challenge. On our resources, on our energy, on our own joy. So, clearly, saying, “Hey everybody, come on in! We’ll be responsible for you!” is not healthy. Not healthy to us as American humans or as a nation. Separate ourselves from others through blame, judgement and devaluation. Believe that the end justifies the means, placing policy over people and their welfare. Perhaps not? Some of it sounds pretty mean and heartless. And when we are being challenged (the way that we can feel that illegal immigrants challenge us), we can be triggered into a default way of thinking, feeling and wanting that we are barely, if at all, conscious of. We can have an inner experience like what’s described above, without being aware of it. Conscious or not, too thick boundaries are not healthy for us as humans or as a nation. As humans, when our boundaries are impenetrable, they keep us protected and everyone else out. And it keeps us alone. Physically, emotionally, or both. It prevents intimacy, connection, love. Something we all need. As humans and as a country. As a nation, thick boundaries (whether through walls or policies or tariffs) assume that we can survive somehow completely on our own in the world, without friends, without allies, without alliances. And we can’t. Not in the long run. Regardless of our tendencies to lean toward blurred boundaries or too thick boundaries, empathetic compassion can keep us in relationship when it’s hard to be in relationship. Empathetic compassion taps into our heart, connecting us with the feelings and needs of others. When we are empathetically compassionate, we know, care and share in the feelings of others. It keeps us leaning toward others versus away when the going gets tough. People who don’t experience empathetic compassion, simply don’t care about the thinking, feeling, and wanting of people, especially when they are in opposition with them. Many things can block people from experiencing empathetic compassion. Personal hardship, wealth, racism, righteousness. (See more on Empathy in this related blog post.) And it’s rarely a conscious choice people make. It’s often a result of how their brains have been shaped by the events and relationships of their lives. Most of us are unaware of how boundaried or compassionate we are when we are being challenged. These aspects of our internal experience are largely unconscious to us. (That’s why we created the EQ Profile – to help make what’s unconscious to us about our inner world, more conscious). For the most part, boundaries and compassion are not conscious choices we make. Rather, they are the result of the relationships and events of our lives and the meaning we’ve made from them. Those relationships and experiences have influenced our beliefs about what’s required for us to survive in the world. And the experiences that have created those beliefs have shaped how the neurons in our brains have wired together and determine what feels comfortable and right to us. And what feels comfortable and right gets reinforced as our patterns of thinking, feeling and wanting play out. So, for some people, what feels comfortable and right, what feels necessary for survival, is to keep others out. Understanding this, that our boundaries and our degree of compassion, are not completely our choice, helps me to understand and be empathetic toward the people who favor separating children from their parents as a deterrent to immigration. To be clear, I’m not saying these people aren’t responsible for their actions or that connection or compassion are beyond their choice. I’m simply suggesting that understanding how these folks may have come to their position, understanding their perspective, helps me give them some grace. And I can regard them with compassion as fellow humans. I can give them what they don’t give others or perhaps themselves. It is easy for me to make up a lot of mean and sinister stories about the people who decided separating children from their parents would be a good deterrent to immigration. Making up stories is what we humans do. It’s part of our neurobiological make up. And those stories we make up can easily turn into judgments that then further separate us. So, I can’t and won’t speak to the motivations and intentions of the people who made these decisions. I wasn’t there. I don’t know. And the EQ orientation of those people is one of thick boundaries and low compassion. With such an orientation, illegal immigrants, parents and children can be otherized, blamed, judged, dealt with, and ultimately treated as objects. And all of that can be justified with the belief that the end justifies the means. People in favor of separating children from parents don’t want illegal immigrants coming into our country, using our precious resources, taking our jobs. And they can feel comforted in that stance with the belief that they are in the right. After all, it’s the illegal immigrants who are breaking the law. They are the ones putting their families at risk, not us. They are responsible for their choices. We are just enforcing the laws of our country, as is our right. Right? And people who favor this type of treatment of parents and children, illegal or not, immigrant or not, have developed their orientation (whether they are conscious of it or not) as a means of their own physical and/or emotional survival. Emotional Intelligence is messy. And staying connected and separate and compassionate is challenging and hard and complicated and often uncomfortable. And what’s right isn’t easily determined. And staying in relationship while we figure out our challenges can be energetically draining. Immigration is messy. It’s complicated. It’s not easy to see what’s right. If it was easy, we would have figured it out. And whether referring to EQ or immigration, turning our backs on the pain of others is never the answer. It just can’t be. When we disregard the suffering of others, we are denying and degrading a part of ourselves. We can not disconnect ourselves from others without also disconnecting from a part of ourselves. We all lose when we do. We just may not see it. P.S. If you haven’t yet,Subscribe to our Friday Conversations Blog. P.P.S. Did you know…. you can use insights gleaned from the EQ Profile to better understand clients and other people, even without them taking the assessment? 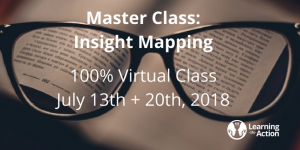 Learn how in July at our new Master Class: Insight Mapping. 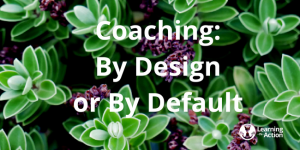 Coaching: By Design or By Default? I’d rather listen to this than read it. A number of years ago, I began to see a pattern in myself that I could no longer overlook. Whenever I coached an older female client, I experienced an internal dialogue that was critical of them. YIKES! That’s a big f-ing deal! The foundation of my work as a coach is in seeing the hero in every client. My internal disparagements were infecting me and my client relationships and souring our results. Oh, I could always justify or explain away my criticism. “She’s being a victim.” “She’s just wanting attention.” But when I looked at my default patterns and the results they created, it was clear. I was the problem. We all have patterns. Patterns of thinking, feeling, and wanting that reflect experiences from our past and how we’ve been shaped by them. Not metaphorically or figuratively shaped, but literally, neurobiologically shaped. Our brains, our minds and our bodies have been shaped by the events of our lives and the meaning we’ve made from them. And if we are not aware of it, we bring that pattern of being into our present moment experiences with our clients. The perniciousness of these patterns is that they tend to be invisible to us. They are our “default settings.” They lie outside our conscious awareness. And because our patterns are largely hidden, we will tend to cling to, explain and defend them, even when they don’t serve us or our clients. We will experience a given moment and believe that our internal reactions are reasonable and responsive to the unique situation at hand. And yet with help from reflection and self-examination, we can see that we’ve had many moments just like this one, with different people, in different circumstances, that yielded similar results. And we are the common denominator. One way we can detect these hidden default patterns is through self-reflection. In reflection, we can become aware of how our unconscious self can take over, applying a lens colored by the past, to the present moment. Reflection helps us see trends in relationships, behaviors, performance and outcomes that we wouldn’t see otherwise. As coaches, we are always on the lookout for our own patterns. Because our nonconscious patterns show up in our coaching. Whether we want them to or not. And whether we know it or not. Just like mine did. We have a responsibility to our clients, ourselves and our coaching to learn as much as possible about our default patterns so that our coaching is responsive to our client’s present moment and not a reflex from our past that we can’t see. If you’ve been following this blog, you know where I’m going with this. IMO, there is no better way of shining a light on our default patterns (and how they are likely to show up in our coaching) than experiencing the EQ Profile. The EQ Profile reveals our default patterns of thinking, feeling and wanting that get in the way of being present in our coaching. From my own EQ Profile, I became aware of my desire to self-soothe by acting quickly in the face of a challenge. Before I became aware of this pattern, I would non-consciously coach my clients toward taking action when they were challenged, maybe even before they were ready. I was unconsciously projecting my own self-soothing strategy onto my client. Not good! And the only way I became aware of that pattern is from my EQ Profile. We can coach by design or by default. We can avoid taking what can be a confronting look at ourselves, and continue to coach from patterns we are oblivious to. Or we can proactively and deeply reflect on our lives from different perspectives using a variety of tools and techniques, become aware of our patterns, and design more intentional choices in our coaching that get our clients better results. The choice we are making by doing the work of introspection is the same choice we are asking our clients to make. To examine the hard-to-see aspects of ourselves so that we can create ourselves. We can express our true self in all of our uniqueness instead of following the imprint made upon us by others from our past. We can coach from the space of design versus default. We can be the example for our clients of living a life by design and not by default. Do you know your default patterns? Do you know how they show up in your coaching? P.S. Our 2018 training calendar is now set. Check out the entire course catalog or click on the link below for our two new Team Training courses launching soon. This week, while Alison Whitmire takes a week off from her blog, we welcome a guest blogger: our own Corrie Weikle*, Learning in Action’s Director of Training. There were five minutes left on the clock. My ice hockey team was down 2-1 to move on to the national championship. It was the classic “Not enough time left, and my team is down by one point to get to the big game” story. You’ve heard it before. The bench where my team sat was a depressing place to be. Having little emotional literacy at that point in my life, I’d say we were a bunch of doubt-filled, negative Nancy, glass half-empty miserable people. The stakes were high, stress was soaring, and we were consumed by our own risk-driven internal experiences. If you’ve happened to take the EQ Profile and you recall the dimensions, you’d say my teammates and I were primarily negatively-oriented, and likely over-accessing many of our distressing feelings. Everything we had worked so hard for was on the line, and our ability to perform at our best was traded for sloppy mistakes and anxiety-induced inconsistent teamwork. As a team captain, I was leading from a place of fear, risk, and disconnection. I couldn’t see beyond my own lens that I was applying to the situation. I was focusing on a minuscule amount of all available information and accepting it as a truth. I didn’t have knowledge or skills in reading my teammates, and so I had zero awareness of the internal experience that they brought to this conflict with me. Above all, I didn’t think I had a choice in how to react to the situation or to my team members. I share this story because it is not unlike many of the workplace teams we work with and coach today. 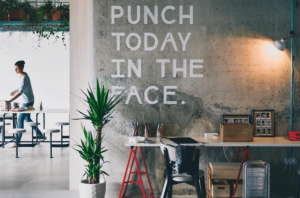 A workplace team with tremendous talent, trying to accomplish big things in the world, and full of blind spots, can be derailed by the inability to successfully move through conflict and stress. A championship might not be on the line, but stakes are high for any business. 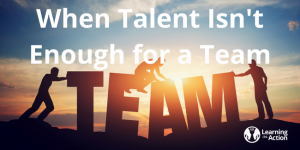 The common denominator of sports teams and workplace teams? Micro, and sometimes macro, conflicts are the norm when it comes to working with other people, including the most talented of people. As coaches, we know there is no question that emotional intelligence is essential for overall team effectiveness. That story has been researched and told many times. 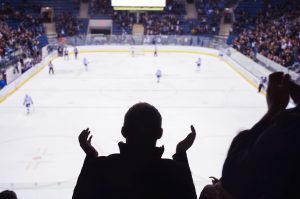 Instead of focusing on the team as a whole, I ask this question: How can emotional literacy and deep awareness of our own internal experience allow us to become a better teammate, coach, or leader? And what is underneath that awareness? How does self-awareness of our default patterns cultivate connection and allow us to work in team environments more effectively? Seeking to understand our own internal experience means seeking a vocabulary to communicate our internal experience with those we are in relationship with. When others don’t understand us, it can be frustrating. Sharing a common vocabulary allows us to connect, communicate and focus on how we see the world with those we interact with. I’ve heard countless stories from you, our coaches, about how the team you are working with repeatedly experiences shades of the same conflicts. When each team member gains the language to discuss the lens they see the world through, the results can be a game-changer. With awareness, the team cultivates a new vocabulary to communicate their internal experience. Instead of focusing on the conflict itself, the conversation focuses on which teammates see risk vs. possibility in the situation. The team focuses on how anxiety or fear might be showing up for some, while others are feeling triggered with frustration. Through communicating the lens we are applying, we move effectively through conflict and stay in relationship with our teammates. Our lens and focus determine how we give and take feedback. Effective feedback cycles require trust. Giving and taking feedback is imperative for team success. But what if our internal experience blind spots become behavioral? That can keep us from receiving the authentic feedback we need to be successful. Or what if our own focus on the contributions of others to the problem is keeping us from seeing our own role in it? This might propel us to provide feedback to our team that appears shameless or unaware, as if our own stuff doesn’t stink. Learning a deep understanding of our default patterns and where we are likely to focus under stress, helps us understand where we might be getting in our own way when it comes to giving and taking feedback.The bedrock of team effectiveness is trust. Awareness of our lens and focus cultivates opportunities to build trust, instead of unconsciously breaking that trust. The more we understand our own world lens and default patterns, the more we can get curious and authentically connect with the other. Understanding ourselves means understanding how we were shaped in relationship at a very young age. Self-awareness for me has been a challenging and rewarding exercise in empathy compassion, both for myself and for those I work with closely. 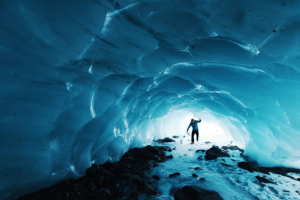 The deeper our understanding of the nuances and drivers of our own internal experience, the more we can get curious and be intentional in empathizing and connecting with others in their internal experience. Imagine a team leader who can shift the energy and conflict dynamic because they are able to feel their own distressing feelings, and then be with their teammates who are experiencing their own unique distressing feelings, too. To finish the hockey game story, we lost the game. As I think back (with a lens of self-awareness, of course), it was a heart-wrenching loss. Not because we didn’t make it to the national championship, but because our own blind spots and lack of awareness kept us from working effectively together. We missed the opportunity to move through the challenges presented by the game. We got in our own way. Our talent wasn’t enough. This story is a sliver of my overall athletic experiences in which I got in my own way because of my lack of self-awareness. If I had these awarenesses, I would have been on a completely different playing field. 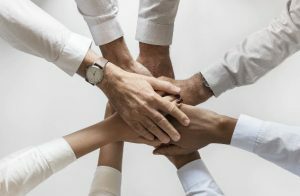 I would have been able to engage with my team in a connected, leader-driven way, instead of the disconnection, negative-orientation, and lack of compassion I brought instead. This experience was the catalyst that drove me to question how my lens determines and contributes to the outcomes of the teams I work with and for. Has your lens and focus impacted your ability to work on a team effectively? Do you see this with the teams you coach? Has the lens of the EQ Profile helped you to engage differently with the teams you coach? *Corrie Weikle is Director of Training at Learning in Action, where she manages the training programs and courses, develops educational resources, as well as assists in business development. I’d rather listen than read this. My father passed away recently and we held the memorial service for him last weekend. While an unconscionable amount of drama preceded it, the service itself and our time together was precious and sweet and everything I could have hoped for. I was able to share my profound sadness with my family and friends and join with them in theirs. The permanence, realness and finality of the loss of my father made so many unimportant things fall away. I had more meaningful, heartfelt, teary-eyed conversations with my family and friends than I have, maybe ever. The whole experience was such a gift. Every emotion contains information for us that no other dimension of our experience possesses. The information within sadness is that of loss. Our sadness tells us that we’ve experienced a loss of someone or something important to us (or someone close to us has). This description makes unpacking loss seem much simpler than it is. Loss is not easily untangled, teased out and identified. That is part of why experiencing loss can feel so overwhelming. My dad was the single most important person in my life, for most of my life. When he passed, I lost more than just my father. I lost someone who believed in me, accepted me and loved me without condition. I lost the head of our family, the one who convened us, looked out for us and knitted us all together. I lost my advisor, mentor, and emotional sponsor. I lost the person who humbly embodied so many of the qualities to which I aspire. I lost my hero. 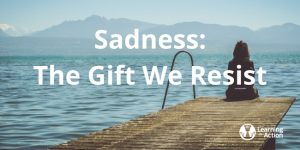 The gift of sadness, should we allow ourselves to accept it, is sensitivity, intimacy and connection. When we allow ourselves to experience sadness, we connect with our deepest self. We connect with our heart and who or what is dear to us. And when we share our sadness with others, we invite them to feel us and to feel with us. And when we allow ourselves to feel our own sadness, we can be with and connect with others in theirs. Sadness is like an emotional bridge that joins us with others, connecting our hearts. At my father’s service, anyone who wanted to, was invited to share whatever was in their hearts. I was drawn to tears by the tears of my family as they spoke about my dad and who he was to them. I felt connected with them in our shared sadness. And when I spoke, I was able to feel more of my own feelings by seeing them reflected in the eyes of my family and friends. Such is the gift of sadness when shared. Sadness connects, self with self and self with others. Sadness is painful. No doubt. And at times denying, avoiding or dismissing that pain can be what we need. To cope. To get through. To give ourselves a break. But when denying our sadness becomes something more than temporary, it can extract a great cost. This was illustrated in an exchange I had at a training a few years ago. My dad was sick at the time, and his doctor (not knowing the measure of the man he was dealing with), didn’t expect him to live, and called in hospice. (This was the first of several times over the following three years in which he was given weeks or days to live.) I left my father’s bedside to conduct a training. I can’t imagine the overwhelming loss this coach must have been experiencing. Perhaps to access all of the sadness within that loss would have been incapacitating. Perhaps she was coping with all that loss as best she could by denying the sadness of it. And by denying her own sadness, she could not be with me in mine. And, though unintentional, she invalidated my sadness. When we can not, or do not, allow ourselves to access our own sadness, we can not be with others in theirs. Hence, the risk of not accessing our own sadness is insensitivity, invalidation and disconnection. Insensitivity to the pain of others, invalidation of the sadness of others, resulting in disconnection from others. Sadness is an emotional muscle that when exercised is more easily recruited. Once we’ve experienced loss and the accompanying sadness, it can be much easier to access. As we age, we tend to access sadness more easily because we’ve had more life experience, and experienced more loss. May have experienced great loss and not have not found a way to process, accept and/or reframe their experience. May be emotionally and/or physically fatigued and not attending to their own well-being and self care. People who have high access to sadness (that falls short of depression) may benefit from reflecting on their sadness and what’s underneath it, using the bullets above as a guide. 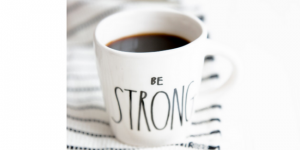 When someone has experienced significant loss and doesn’t appear sad, it’s often said that they are “being really strong.” I get irked by that. People who experience loss and tearlessly power through it are coping. Let’s call it what it is. Coping. And that’s OK. Coping is good. Coping is necessary. Sometimes. But is it strength? If someone experiences significant loss and is visibly in mourning, are they then weak? I don’t think so. 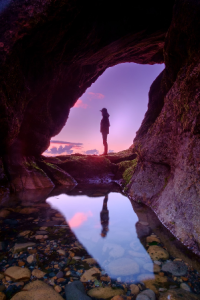 While non-feeling, as reflected in coping, has its place, it ultimately serves to disconnect us from ourselves and others. Only by connecting with our emotions can we connect with others in theirs. Yes, the distressing emotions (anger, anxiety, fear, sadness, shame) are distressing. Sadness is painful. And feeling our feelings, while we are having them and expressing them in safe and appropriate ways, is a key aspect of being emotionally healthy and emotionally intelligent. How do you come to understand your sadness? 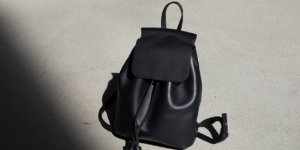 How do you unpack your loss? How has your own sadness connected you with someone else? I didn’t see myself as angry early in my career … and I was. I accessed higher than ideal levels of anger, but didn’t recognize that within myself. Looking back, I can now understand both why I didn’t see the anger within me, and how my unrecognized anger hurt my working relationships. This blog post is written with the hopes of opening the eyes of others who have high access to anger, but can’t see it. In my early working life, I was acting out a pattern of behavior that had been modeled in my home throughout my childhood. To be clear, I, and only I, am responsible for my behavior. Now and then. And what is true is that I was shaped by my earliest relationships. And anger played a role in the shaping. I didn’t see my anger because it was my default experience. It’s what was modeled for me and how I was wired to conduct day to day interactions. I didn’t experience myself as angry or not angry. I just was. We are all shaped by our primary relationships. And not simply metaphorically, but also, neurobiologically. Meaning, the neural wiring of our brains, our mental models, our implicit understanding of what is is and isn’t acceptable are all shaped by our earliest relationships. And it can blind us to certain aspects of ourselves. I just wanted to get s%$t done. I wanted to be successful. I didn’t think much about how I did that. I just did it. And because I was unaware of my inner experience and how that experience was playing out, I didn’t make the kinds of connections with my co-workers that would have enabled me to be more successful. I’m not the only person who accesses anger without feeling it, knowing it, or seeing it. I believe there are armies of people, just like the younger me, in workplaces across America. While there are a number of studies on Anger in the Workplace, they are mainly about physically aggressive or verbally abusive behavior. The more common, more subtle, more pernicious presence of anger is in the non-conscious internal experience of anger that people access and don’t see. Meaning, many people access anger and don’t recognize it in themselves. When anger is a dominant part of our internal experience and is not overtly manifest in our behavior, it’s easy for us to dismiss the notion that we might be accessing anger. In fact, I’ve worked with a number of clients who reported (in their EQ Profile) experiencing anger more than any other distressing emotion, and still didn’t recognize the anger in themselves. Anger has a recognizable fingerprint (if you know what to look for …and want to see it). Anger, like other emotions, has a direction. Anger points outward. “I’m angry at you.” The focus of anger is on the Other. (The Other person, the Other thing, Other Situation). People who have high access to anger tend to focus outside of themselves when challenged. That might look like blaming or judging or competing with or dominating the Other. Or like feeling victimized by the Other. The essence of anger is rejection, resistance or non-acceptance of something or someone. There is no curiosity in anger, no openness, no uncertainty. Anger is right! Maybe even righteous! Some people enjoy the feeling of anger because it provides them with clarity, with a feeling of being right. If we are feeling right, there is a good chance we are also accessing anger! The underlying meaning of anger is essentially, “I’ve been wronged.” That’s why anger makes us feel so right! Exactly what that wrong is, is unique to the person experiencing the anger and the meaning they’ve made of the situation. People who are angry can be convinced of the absolute correctness of their response. However, for any given situation that provokes anger in one person, the exact same situation can occur for someone else and they will not access anger. Our anger is all about the meaning we’ve made of the situation, and is unique to us. The internal language that someone accessing higher levels of anger might use to explain to someone why they are angry would sound like, “You are wrong!” “You wronged me.” “You are at fault.” “You are to blame.” Most people would not externalize this language, particularly in the workplace, however it would be the voice of their internal experience. Again, the focus is on the Other. It’s common for clients who have easy access to anger not to see it. And though it may show up in their 360 feedback, that often merely reinforces their focus on the Other. The key is to connect them with their inner experience using what you both witness together in your coaching sessions. Listen and mirror the emotion words your client uses. As your client describes challenging situations, listen for words like “frustrating,” “annoying,” “irritating” (all anger words) and mirror that and be curious. Listen and mirror the focus of your client’s words. As your client describes challenging situations, listen for where their focus is. If it’s on the Other or outside themselves or if they are giving their power away, mirror that and be curious. Attend to your client’s tone of voice, facial expressions and body language. Some clients don’t use emotive words, however, their voice, facial expressions and / or body language may appear rigid, tight, defensive or resistant. Mirror that and be curious. These approaches can help your client connect more fully with their internal experience, giving them more access to themselves. Anger can be disconnecting because the focus shifts so strongly to the Other. And turning your client’s attention back on themselves can connect them more with themselves and ultimately with others. Do you have clients who don’t see their anger? What have you tried to help them see it? How have you helped your clients see their anger and connect more fully to themselves?